Aromatherapy Massage has all the benefits of the Swedish Massage but aims to treat the whole person by helping restore the harmony of mind, body and spirit. 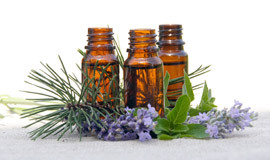 Using blends from fresh, organic and natural ingredients you and your therapist will decide on which Aromatherapy essential oils will best suit your present mood, giving you that instant therapeutic effect. Relaxation – the Relaxation blend is a natural alternative to help you unwind and comfort the mind, body and soul. Refresh – the Refresh blend will help you re-energise, by revitalising the body and elating the senses. Equilibrium – This blend is the natural alternative to soothe and balance; helpful for women during menstruation and the menopause. Mobility – A natural blend for supple muscles and joints. Detox – A powerful aromatherapy blend, which encourages elimination of toxins and helps with the appearance of cellulite.